Former undrafted free agent out of Missouri Jacquies Smith has signed his restricted free agent tender worth just over $1.7 million with the Tampa Bay Buccaneers. Smith drew very little interest this offseason largely due to a torn ACL that he suffered in Week 1 of the 2016 season, limiting him to just one snap all season. 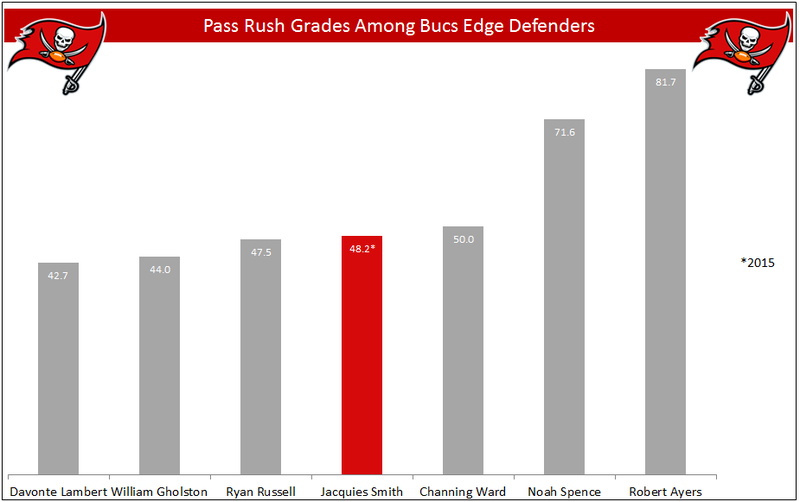 Smith figures to compete for a situational pass-rush role in 2017 as he rushed the passer on 67.5 percent of his defensive snaps in 2014 and 58.7 percent in 2015. Now entering his fourth season in the NFL, Smith registered 28 pressures in 2014 and 23 pressures in 2015.